A melting pot of myriad cultures, the cosmopolitan life in Mumbai, sets an example to other cities and villages on how to integrate customs, traditions and religious practices of many faiths into a unique blend of co-existence. Despite the relentless march of economic progress and social changes, the Maharashtrians have preserved their rich heritage that showcases its splendid literature, folk music, dance and religious customs. Marathi theatre has profound influence on the people as stage plays draw huge audience who are regular patrons of such entertainment platforms. In fact, theatre, television and movies are indispensable for a Maharashtrian. Mumbai is the nub of Indian film and entertainment industry. The commercial capital is the hot seat of Bollywood (as Hindi cinema is called) with elegant studios and production houses engaged in making films that cast a web of glamour and deceit among the youth. Dadasaheb Phalke is the father of Indian films as he produced the first (silent) motion picture "Raja Harishchandra" (1913) that opened the floodgate of commercial movie industry. Beautiful monuments, heritage structures and scenic places on the WesternGhats along with perennial rivers give Maharashtra a geographical vastness for people to explore and get enchanted by its diversity. 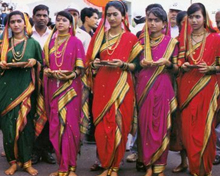 The folk women can be seen wearing the traditional sari that is known as "Nauvari", meaning nine yard. This sari has its own history where this type of sari was accepted during the rule of Marathas. It was worn by women during war times so that even they could help their husbands who were fighting at the battleground. The traditional dress for men in Maharashtra involves the basic dhoti and a shirt which they called the "Pheta". The traditional attire is incomplete without their usual headgear which is a simple cap. Several people also use to tie a "pagdi" or a turban which is fading away from the scene. The diversity and the richness of Marathi culture drips down to its traditional dance forms too. One very interesting dance form in the state is the "Povada". Based around the life of Emperor Shivaji Rao, this dance form is mesmerizing to see. "Lavani" and "Koli" dances are also particularly famous for their rhythm and grammar. "Dindi", "Dhangri Gaja", "Tamasha" and "Kala" are all part of its folk dance repertoire. The festivals are a true reflection of Maharashtrian culture, with all its colourful customs, rituals and traditions. The song, music and dance that accompany almost every festive occasion add joy and excitement to the lives of the people from every walk of life. The festivals are a tribute to Maharashtra's rich culture and legacy. Maharashtrian calendar is dotted with festivals all- round the year. The love for celebration is deeply embedded in their culture and it finds expression through the various occasions. Community gathering and worship is quite common in Ganesh Chathurthi. Lord Ganesh, the patron deity of Maharashtra, is the God of wisdom. In August, preparations to celebrate Ganesh Chaturthi - the auspicious day when Lord Ganesh was born - begin with great enthusiasm all over the state. The 11-day festival begins with the installation of beautifully sculpted Ganesh idols in homes and mandaps (large tents), colourfully decorated, depicting religious themes or current events. Many cultural events are organised and people participate in them with keen interest. After ten exciting days comes the time to bid farewell to the divine tusker. 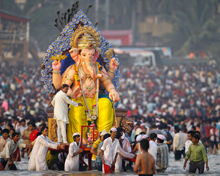 People take Ganesh idols in procession to the accompaniment of music and dance for immersion in the sea, nearby river or lake. Other festivals celebrated with much fanfare are Diwali, Makar Sankrant(related to zodiac change), Nag Panchami (honouring snake), Gudi Padwa(Marathi New Year), Pola (harvest festival), Narali Pournima (full moon), Gokul Ashtami (Lord Krishna's birthday), Dussehra and Holi or Vasant Panchami. The cultural antiquity and long-held customs of Maharasthrians are brought to the fore in these religious festivals celebrated throughout the year. Mumbai Metro Region (MMR) with a population of 20 million is home to thousands of migrants who pour in from all parts of India in search of livelihood. Space is a premium in this commercial hub as rentals of modest apartments (say 500-650 sq. 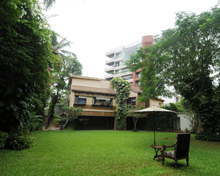 feet) is anywhere between Rs 20,000-25,000 per month at posh areas like Bandra, Juhu, Andheri and South Mumbai. Renting a home or an apartment for stay is a tough proposition as people are willing to pay more to just live in a modest accommodation. Secondly, commuting to and from workplace is hectic as most of the Mumbaikars travel far from their homes to reach offices. This most cosmopolitan city in South Asia never goes to sleep. A sprawling city on the western coastline of India offers a number of attractions like shopping malls, glitzy restaurants, food joints and multiplexes (that include movie halls) for those having deep pockets. While working couples may not have time during weekdays, they eagerly look forward to weekends as the entire families move out to suburbs or beachside villas to enjoy the scenic spots. 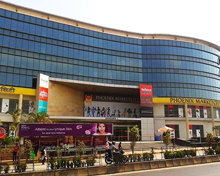 Mumbai can be called a retailer's paradise as a whole range of consumer durables, clothing, accessories, furniture and other utility items are available at bargain prices. Most of the residential areas are very much crowded and a middle-class family has to put up with crammed up space, sometime sharing common space with neighbours. But there are beautiful parks, serene beaches and waterfront drive that offer a much needed relaxation for the stressed out Mumbaikars. Religious festivals and important events in families are celebrated with fanfare in Mumbai. Visiting temples, churches or mosques and exchanging social pleasantries among relatives are age-old customs among the Mumbaikars. While they are money-minded with shrewdness of an acute businessman, the people, however, walk an extra mile to help outsiders or visitors in need of help. Social harmony and camaraderie keep the spirit of Mumbaikars in buoyant mood. They are hardworking and religious, but at the same time never discriminate people based on their social upbringing. Mumbai is the costliest place to live in India. High rentals, soaring food prices and transport charges pile up the misery of middle-income households. But at the same time there are growing opportunities in trade, services and core industries as foreign investors view Mumbai as the most favourable destination. Mumbai continues to be the most expensive city in India and is ranked at 74th place above Dallas (77), Munich (87), Luxembourg (94), Frankfurt (98) and Vancouver (119) in terms of cost of living, according to the Mercer Survey for 2015. Mumbai has witnessed higher inflation compared to other metro cities, higher cost of fuel, transportation, increased prices of food items, home services and rentals, impacting the cost of living. Nicknamed as the fashion capital of India, the vibrant metro churns out nearly 150-170 Hindi films a year. Bollywood as the Hindi film industry is called attracts thousands of aspiring actors and technicians who aim to make it big in a highly competitive market. Box office hits make instant millionaires out of paupers and vice-versa. A number of TV channels, production houses and content providers work in the media industry 24x7 to bring smiles to the drawing rooms of millions of viewers across the world.